From the mid-19th century to the late 20th, Music Halls were some of England’s most popular entertainment destinations. They were accessible venues, allowing audiences of varying sizes the opportunity to eat and drink right in the auditorium while they were being entertained by performers on stage. This afforded the music halls a relaxing atmosphere that made them a welcome reprieve from daily stresses. Music Halls originated from the taverns and coffee houses of the 18th century, where people went to eat and drink and were occasionally entertained by performers, mostly singers. They would perform traditional folk songs which audiences were encouraged to join in with. 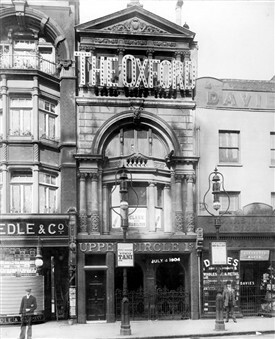 Photo of Oxford Music Hall, Tottenham Court Road. July 4, 1904. Eventually some taverns developed rooms especially for this sort of entertainment-dining. 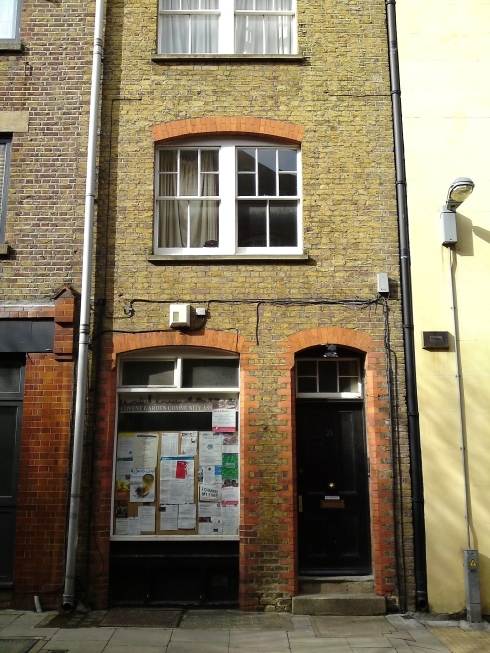 Aimed at the middle class, – though working class and upper class men were welcome as well - they were known as song-and-supper rooms, and they stayed open until early in the morning. Consequently, and not entirely undeservedly, they had sketchy reputations. The audiences were often unruly and it was not uncommon for patrons to throw something at the performers if it was not to their liking, or if they were drunk. 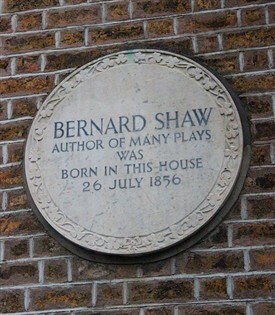 In the West End, men were encouraged to bring their wives, as it was thought to have a calming effect on the audience. Not many did and prostitutes saw a good market, and could often be seen walking up and down the aisles. The idea transformed still further when new music styles gripped the age. Taking a cue from American songwriter Stephen Foster, songs began to develop based on his style that injected the energy of Black spiritual songs into traditional folk song. Influences came from the continent as well, and the emerging English musical style included bits and pieces of the jig, polka and waltz. These new songs, such as “Knocked ‘em in the Old Kent Road”, “Boiled Beef and Carrots”, and “Glorious Beer”, were performed at Music Halls. Music Halls became so popular that by 1875 there were more than 300 of them in London. Particularly famous venues were The Alhambra and the Empire. The craze became so big that eventually going to a Music Hall became less about the food and drink and more about going to see the performances. Music Halls came to fit in as many as twenty acts per show, lasting up to four hours. The most successful performers could make a lot of money in one night, travelling between Music Halls in their carriages. Many of them died young, likely out of stress. 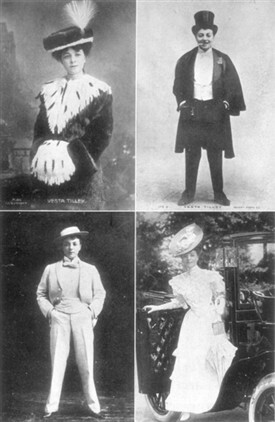 Four photographs of Vesta Tilley, a famous cross-dressing Music Hall performer most famous for recruitment performances during WWI. The Melodies Linger On: The Story of Music Hall by W. Macqueen Pope. c1900. The popularity of Music Halls climaxed during the First World War. From 1914 to 1918, composers, actors, singers, and performers of all kinds, threw themselves at the task of lifting public morale and enthusiasm for the war. Songs were performed that aided in recruitment, promoted patriotism, and admonished those that did not contribute to the war effort. Such songs included: “All the Boys in Khaki get the Nice Girls,” and “What did you do in the Great War Daddy?” There were also songs that satirized aspects of the war, such as “I’ve Got a Bit of a Blighty One.” Performed by famous male impersonator Vesta Tilley, it humorously portrayed a soldier with an injury just severe enough to be recalled from active service, but not too severe that he was terribly inconvenienced. Tilley herself became known as Britain’s best recruiting sergeant, her extremely popular shows encouraged young men to join the war effort and promoted the sale of war bonds. Music Hall’s popularity declined after the war with the rise of jazz and swing music. It experienced a brief resurgence in the 1930s, with such songs as “Percy of Pimlico” finding their way back, briefly, into the limelight. But by then the Music Halls were no longer allowed to serve drinks in their auditoria, weakening their appeal. With the arrival of Rock and Roll in the 1950s, Music Hall was becoming more and more an archaic aspect of Britain’s musical culture. From 1953 -1983 the BBC kept the tradition alive with its TV series The Good Old Days, but with the advent of television Music Hall's days were numbered. Music Halls are fondly remembered today. They are no longer popular entertainment, but have rather become the territory of English nostalgia, with spiritual successors in stage musicals such as My Fair Lady. I believe the Oxford Theatre was in Oxford St. Now the site part of the Primark clothing store?